So far this year, the state of Michigan has given us at least two outstanding albums. if you missed the new ones from Nick Piunti or Ryan Allen, it would be wise for you to give these a listen. Now, another Michigan product gives us another poppy gem. It’s The Legal Matters’ Conrad. The harmonies are glorious from the opening Chris Richards’ penned “Anything”. to the final “Better Days”. “Minor Key” is a real winner with its Beach Boys feel and infectious melody. It’s the perfect track when the top down and the wind your hair. A Keith Klingsmen contribution, “Pull My String” has the kind of shimmer and jangle that made for any number of Mitch Easter produced hits in the 80’s. Although Easter had nothing to do with the recording, it somehow felt like an REM track to me. “Who killed all the rock n roll stars? The ones that used to make us want to play our guitars? It makes me wonder who’s fu**ing up the scene. If we all jump off the merry-go-round, we can being back everything”. With a killer hook and some big, meaty guitars, this track is nothing short of pop bliss. 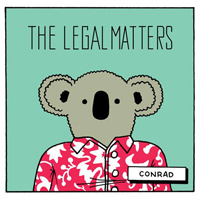 The Legal Matters’ Conrad is surely among the best power pop albums of this year. Pick this one up from Kool Kat Records or Amazon.com.